Yum! Raspberry Coconut Mousse. Just because you are vegan, does not mean you need to give up desserts like mousse. This healthy mousse is sure to please. This healthy mousse can be made in a matter of minutes and it’s rich in texture and taste. If you haven’t guessed by now, I just love the combo of raspberry and coconut. If you love this combo as well, you may want to check out my Raspberry Coconut Muffins or my Raspberry Coconut Smoothie. If you don’t want to use raspberries, you can always replace them with strawberries or any other fruit. This heavenly raspberry coconut mousse is vegan, gluten free and paleo. It only calls for a few simple ingredients. Chocolate chips may be a nice addition as well. I used fresh raspberries, but I am guessing you can use use frozen as well. Just let them thaw and drain before you use them in this recipe. Make this delectable mousse in just a few minutes! 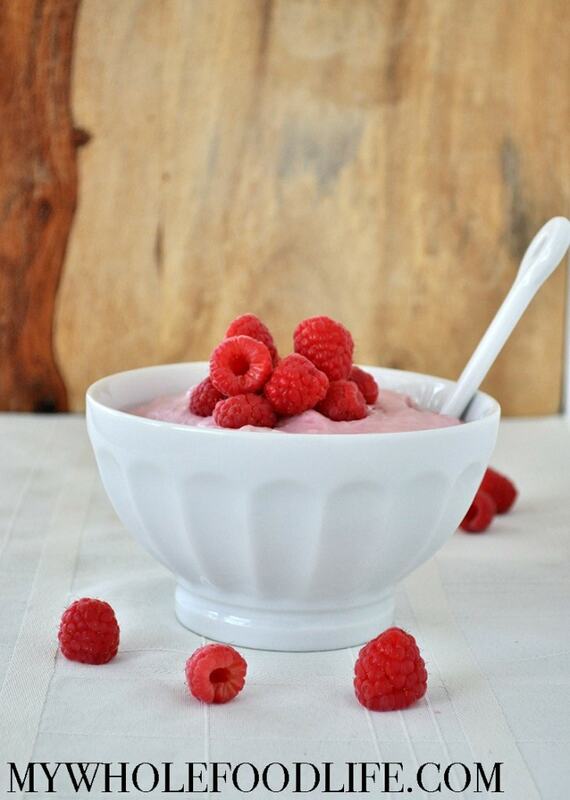 In a small blender or food processor , blend the raspberries. Using a whipping attachment on your mixer , whip the coconut milk into a cream. Then slowly add the raspberries and maple syrup. Whip until everything is incorporated. Transfer the mousse into serving dishes and place in the fridge until you want to serve. You can also eat it right away if you like. Can you use a hand blender? I only have a nutribullet or vitamix. AN ELECTRIC HAND MIXER WORKS FINE. Thank you! Just mix until combined. Do you think this would work as a frosting for a 2 layer cake? It could. It may not stand out of the fridge for long, though.